Would anybody know if the view from the a seat in section 126 is likely to obstructed by the mixing board area? I bought a ticket in the presale thinking it would be a great view as its bang right in the center on the lower concourse. I didn't factor in that anything would be in front of it other than fans on the field and the stage. Now I'm second guessing. Not sure where else the sound guys would go other than at the back and in the center. The ticket didn't say obstructed view but it was only $70, which is cheaper than seats in 123 that I saw, which I thought would not have been as good a view. Anybody have experience at previous gigs that could maybe put mind at ease? It shouldn't be an issue but it depends on how high up you are in that section. I had a seat in that area for 360 tour in a lower row and there were speakers and other obstructions. I don't believe it was related to the mixing board area... anyway, they moved us to higher row in the same section. They set aside seats to relocate people. If it doesn't say obstructed view on the ticket and your view is obstructed they will move you. Thanks for the info. Hopefully it won't be an issue. Can I ask? Was the view still good in the higher up seats? Or would you not recommend that section of the stadium? Those seats will be fine. I have only been to 2 stadium shows for U2, both on the 360 tour. For the other show I had seats behind the stage. I thoroughly enjoyed both of them very much. Here's my take on stadium concerts...because of their size, they can make for a less intimate experience, but U2 does a great job with stage design and video to make the stadium feel smaller, giving the feeling that you are closer than you really are. So I personally don't feel that any seated section is that much better than any other. I was in sec 112 , Row A, (front row) for the show in Seattle. There was never a suggestion that I would have an obstructed view but I did. (see attached photo) $155 ticket!! I spoke with Guest Services about it and their suggestion was to go higher up and see if I could find an empty seat. (Sold Out show) I think they could have moved me to GA, but they didn't. I've contacted Ticketmaster Customer Service and and I'm waiting to hear back from them with at least an explanation. If you are back and center I would definitely be worried about an obstructed view from the mixing tent. It is pretty big and is indeed back and center. There are also a number of light poles as shown in the photo above. 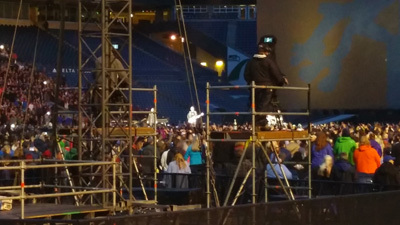 I was in a back lower section off to the right in Seattle with a $100 ticket that was not labeled as obstructed view. I had two light poles between me and the stage and the sound mixing tent kind of blocked my view of the auxiliary stage.